There is an undeniable intrigue about Montana living—the very reason settlers ventured west to this Land of Independence. The quest for a richer life – founded on self-reliance, integrity and a connection to the land. With spacious breathing room, slowed-down tempo, and “good for the soul” living, find out for yourself what makes Sun West Ranch the only one of its kind. Discover your Legacy. Come on Home. An integral part of Sun West Ranch’s vision is to preserve the wildlife habitat (hunting is not allowed) and maintain a healthy environment for the numerous species of flora and fauna found within its natural setting. 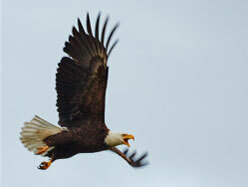 Because of this commitment, the ranch is proud to be a Certified Undaunted Land Steward. Undaunted Stewardship® is a cooperative program directed jointly by Montana State University (Bozeman), the federal Bureau of Land Management and the Montana Stockgrowers Association, with guidance from national and Montana conservation and agriculture groups. Undaunted Stewardship® came from Montana’s ranching and agricultural community and was initiated to recognize the stewardship of private landowners that has resulted in many areas along the Lewis and Clark Trail remaining undeveloped and closely resembling what Lewis and Clark saw during their expedition through the state. The program works to preserve and improve landscapes and communities along the Lewis and Clark Trail in Montana. Sun West Ranch’s approach to conservation complements some influential neighbors: Yellowstone National Park, whose creation in 1872 came at a time when the concept of preserving a large tract of land for “the benefit and enjoyment of the people” was revolutionary, and the famous Lewis & Clark Trail which traces the path of their 1804-1806 expedition. Part of the Greater Yellowstone Ecosystem, the ranch works diligently to ensure the maintenance and preservation of native plants, wildlife habitat and watershed through effective resource planning and management, as well as strong covenants and conservation easements. 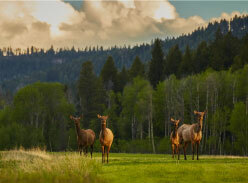 Because of their efforts, approximately 3,000 to 4,000 elk pass through the ranch on the way to their winter range each year. Moose, deer, wolves, coyote, fox, mountain lions, and bears have also been sighted on the property. In addition, the property’s three miles of Madison River provides a pristine and healthy environment for wildlife and recreationists alike. 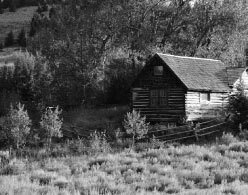 Originally a working cattle ranch, the property was homesteaded by the hard-working mid-westerner, Sam Shelton, who realized his dream to move west and become a cowboy. A driven entrepreneur, he never regretted his decision to make Montana his home. Today the ranch still retains its charming, back-in-time feeling, which includes some of the original buildings from the Shelton homestead. The land has long served as an important migration path for many wild animals over hundreds of years and the river has been home to a thriving population of native fish. To this day, visitors can follow the well-traveled game trails that crisscross the diverse landscape and lead to the life-nourishing waters of the Madison to watch cutthroat gulping on mayflies. Sun West Ranch is your connection to a living heritage. 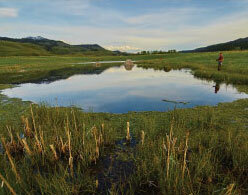 Ted and Heidi Gildred, developers of Sun West Ranch, have a clear vision of place for the ranch. Ted, formerly the U.S. Ambassador to Argentina, purchased the property in the 1970s and together, they share a love of the land and a passion for its preservation and protection. Sun West Ranch has a limited number of home sites and 80% of the ranch is common land to remain undeveloped. “As responsible stewards and to leave the land untouched as possible, we decided development would not be allowed along the Madison River,” says Ted. Hunting is not allowed on the property, which is thick with wildlife, including elk, moose, deer, coyotes, cranes, eagles and grouse as it was hundreds of years ago. “The wildlife seem to know it’s a safe haven now.” Heidi says.